Coast Guard is considering a new rule that would establish yet another SEMS regime and additional requirements for offshore vessels. This effort is both duplicative and unnec- essary and could result in millions of dollars in compliance costs without producing any real benefi ts for crewmem- bers or the environment. It could even have the opposite intended effect, by reducing the focus on safety initiatives and environmental consciousness, in favor of carrying out new legal and administrative tasks instead. The Bureau of Ocean Energy Management, Regula- tion and Enforcement (BOEM) controls the offshore oil & gas lease permitting process. That process has fi nally reached a better pace in the wake of the Ma- condo disaster. Is it moving fast enough? If not; why not? And, what can we do to make that happen? The pace of permitting in shallow and deep water has improved in the Gulf of Mexico since 2010. The Bureau of Safety and Environmental Enforcement (BSEE) ap- proved 129 new wells last year, including 57 in deep wa- ter. By contrast, only 2 deep water permits were issued in 2010. In March, the Bureau of Ocean Energy Management (BOEM) will also be holding the 4th and 5th of 12 lease auctions planned for the Gulf of Mexico area as part of the administration’s 2012-2017 plan. These are positive devel- opments. I’m sure our customers who engage directly in the leasing and permitting processes with DoI have some excel- lent suggestions to improve them, and I believe that BSEE is willing to listen. Admiral Jim Watson’s collaborative style of leadership at BSEE was widely appreciated within the energy industry, and I believe they’re looking forward to continuing that relationship with Admiral Brian Salerno, who replaced him last year. Despite marked improvements in the Gulf of Mexico, I would be remiss if I failed to point out the obvious fact that 86% of federal waters in the Unit- ed States remain off-limits to energy development and the jobs it creates. So while the permitting process in the Gulf has largely rebounded since 2010 despite some kinks in the process, moratoria elsewhere and the cancellation of 2010 lease sales in Alaska and the Atlantic continue to stymie economic growth in other parts of the country. Partnership (AMP) to strengthen the U.S. maritime industry, just to name a few. Tick off the three or four challenges that will immediately impact your tenure. Jim has done an incredible job, and I’ve learned a lot from him during the course of our transition. Our orga- nization is in a better place now because of his efforts, but new challenges in this business are always just around the corner. For one, our country’s energy transportation infra- structure is struggling to keep pace with new sources of sup- ply and shipping routes. That is true in the pipeline, truck- ing, rail, and marine sectors, and it’s critical that America’s energy and transportation industries work together with policymakers to address this challenge. In addition, foot- dragging and hurdles to new offshore energy development outside the Gulf of Mexico are impeding economic growth. Lastly, the breadth and confusing nature of STCW regula- tions published by the Coast Guard in December has left many in the offshore marine industry feeling baffl ed and overwhelmed. This is just a sample of the challenges we are focused on, but they loom large on the horizon. 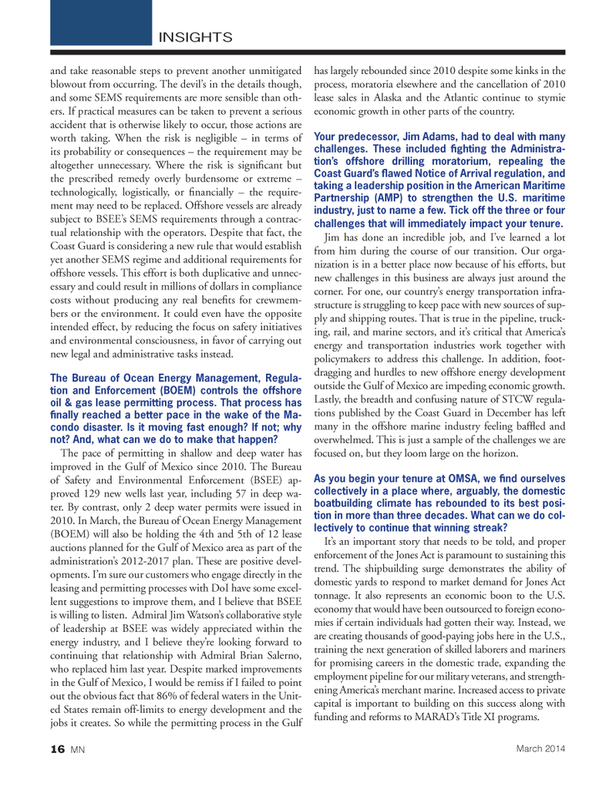 As you begin your tenure at OMSA, we fi nd ourselves collectively in a place where, arguably, the domestic boatbuilding climate has rebounded to its best posi- tion in more than three decades. What can we do col- lectively to continue that winning streak? It’s an important story that needs to be told, and proper enforcement of the Jones Act is paramount to sustaining this trend. The shipbuilding surge demonstrates the ability of domestic yards to respond to market demand for Jones Act tonnage. It also represents an economic boon to the U.S. economy that would have been outsourced to foreign econo- mies if certain individuals had gotten their way. Instead, we are creating thousands of good-paying jobs here in the U.S., training the next generation of skilled laborers and mariners for promising careers in the domestic trade, expanding the employment pipeline for our military veterans, and strength- ening America’s merchant marine. Increased access to private capital is important to building on this success along with funding and reforms to MARAD’s Title XI programs.